Batman head sketch with pencil and marker on paper. Size : 11.9 x 8.5 inches 30.3 x 21.7 cm. Not a print or litho. 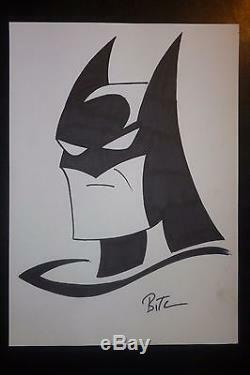 The item "Bruce Timm, Batman sketch original comoc art, Marvel, Harley Queen" is in sale since Tuesday, January 10, 2017. This item is in the category "Art\Art from Dealers & Resellers\Drawings". The seller is "artforsale01" and is located in Budapest.